By Guest Author Richard Leighton. Celery has a reputation as one of the most daunting vegetables to grow. In fact, many people like to grow it for the challenge (which gives you a sense of the personality type of gardeners!) However, once you understand what kind of conditions celery likes, it’s an enjoyable crop to grow in the backyard garden. Celery seedlings growing in a raised garden bed. Why bother to grow celery? Celery is one of the most highly treated conventional crops grown today, with over a dozen different pesticides commonly used. Homegrown organic celery tastes better, has more “snap” when fresh, and is free of the pesticides used by conventional growers. Celery refers to both stalk varieties (the bunches seen in the store) and cutting varieties, which produce bushier heads of smaller stalks. Celeriac is a close relative, grown for the large white root of the plant. I’ll be talking about celery itself, not celeriac, but the growing principles are much the same for both. Celery needs a long growing season, between 130 and 140 days for most varieties. The seeds need to be started indoors, 10 to 12 weeks before your final frost date. For best germination results, use organic seed and soak it overnight before planting. Start in shallow trays of seed-starting mix and press the seeds into the surface of the soil, rather than covering them. Keep the seeds moist as they germinate–this can be aided by putting a loose plastic bag over the tray. Once you have celery seedlings, transplant them into small peat pots or trays with several inches of potting mix, keeping about 2 inches of space between plants. Continue to grow indoors under grow lights until it is time to transplant the seedlings to their final destination in the garden. Keep the soil moist but never waterlogged – celery likes to have its feet wet at all times and the seedling stage is no exception. Celery is a heavy feeder, so work in some compost or organic fertilizer before planting the transplants. It likes high-nitrogen soil, so a chicken manure fertilizer would work well. Choose a location that gets plenty of direct sunlight, unless you live in a zone like the Southwest U.S., in which case, make sure the celery gets afternoon shade or light shade all day. 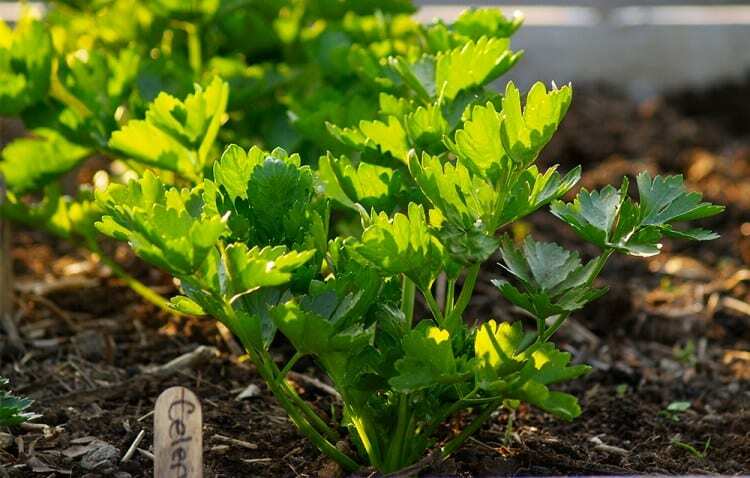 Celery prefers a fairly cool and moist soil, so plant it somewhere easy to water and mulch the soil as needed when temperatures rise. Be careful not to transplant celery too early, as a drop in temperature could kill off the plants. Wait for a consistent temperature of 55° F before planting out, and make sure to harden off your transplants for a few days before you plant them. Space plants 8 inches apart. Make sure your celery has a steady diet of compost tea, fish or seaweed emulsion, or other organic fertilizer throughout the growing season, as well as constant moisture. Dried-out soil makes celery bitter and tough, and not enough organic matter will lead to small or spindly plants. Another way to keep celery happy is by making sure to follow the principles of companion planting. Celery benefits from being planted next to beans, leeks and onions, cabbages, spinach, tomatoes, and flowers like cosmos, daisies, and snapdragons. The flowers are thought to repel pests that like the celery, and the celery repels cabbage moths, making it a great friend to those crops. Avoid putting celery near corn, potatoes, carrots, parsley or parsnips, as these may deter its growth. If you want to ‘blanch’ your celery and keep the inner stalks pale and less strong in taste (and in vitamins, sadly), then you can gently tie the bunches together after about 8 weeks in the garden, to keep the inner stalks from the light. You can also keep mounding up soil around the plants as they grow for the same effect. I personally prefer the dark green, strong-tasting celery and don’t bother with this step. Celery can be planted in soil which has just grown crops such as brassicas, lettuces and leafy greens, cauliflower and cabbage. Following a celery crop, you should avoid planting carrots, dill, parsley or parsnips. Onions or leeks would be a suitable crop to follow celery, as would peas, beans, or garlic. If your celery is grown in good organic soil and kept moist, it should be relatively pest-free. Problems can come from overwatering, causing rotted stalk ends, and under-watering, making the stalks tough, bitter, or causing hollow stalks. You can cut celery stalks individually from the outside of the plant as it grows or you can harvest the whole head at once. If you cut the stalks about 1-2 inches above the soil level and keep the stump watered, it may regrow more celery! Keep your celery in a perforated plastic bag in the fridge and use as soon as possible for best flavor and vitamin content. You can freeze or dry celery pieces for use in soups and stews later, as well. Celery is a biennial plant so it won’t set seed until the second year in the garden. To save celery seed, overwinter some stalks and let them grow out the next summer until they flower. Once the flowers die you will see the seeds start to form. When the celery flowers are brown and dry and begin to fall off the plant shake them into a bag to collect the seed. You can keep celery seed in a sealed container in a cool place for up to five years. Use the seed to plant more celery, or as a spice. Richard Leighton is a farmer by day and an enthusiastic blog writer by night. He has been growing plants and vegetables for most of his life and really enjoys helping others to do the same. His website is GrowerExperts.com where he helps people with everyday garden-related questions.